Terminal hair is the type of natural hair to which most people refer in their everyday lives. It is the type of hair that grows on your head, in your pubic regions and on almost all parts of your body. A hormone called androgen controls this body hair, also known as androgenic hair. Vellus hair, frequently referred to as “peach fuzz,” is the short, fine, colorless hair found all over the body. 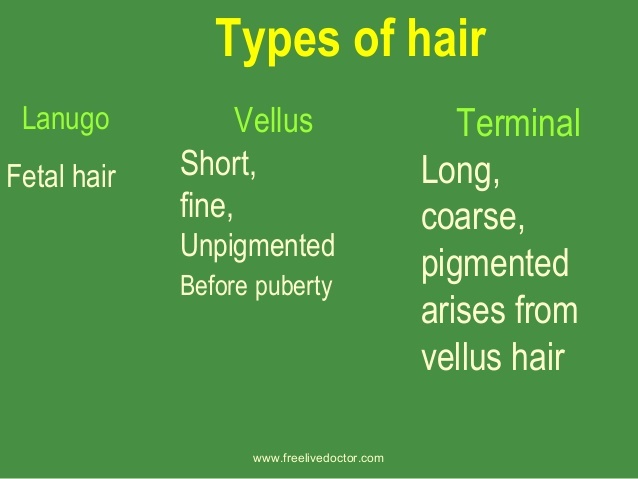 During puberty, vellus hair can turn into intermediate or terminal hair. Vellus hair helps to regulate body temperature. This type of natural hair, associated with women and young children, is fairly unnoticeable. In the case of many men, vellus hair is often obscured by noticeable terminal hair. Lanugo is the special downy hair that completely covers the human baby inside the womb. It is like fur, but before the fetus is born the lanugo hair is replaced by vellus hair. Anorexic women have also been known to have this type of hair on their arms. Andre Walker worked out a classification system for hair using numbers1–4 and letters a,b and c for grouping different types of natural hair based on the amount of curl or wave. 1a would be very straight, densely packed hair while 4c would be tightly curled, loosely packed hair. The LOIS hair classification system identifies natural hair types based on pattern, strand size and texture. The acronym LOIS describes the general hair pattern and the letters stand for the following: L=Bend, O=Curl, I=Straight, and S=Wave (how the hair strands respond when wet). L’Oréal’s MIZANI Natural Curl Key is a classification system that recognizes eight distinct hair types using Roman numerals. It ranges from type I being straight or minimally waved hair to type VIII being zigzag coiled hair. This system is based more on hair pattern than on hair volume or its response to moisture.